October is starting, the best month for climbing here in Catalonia and the beginning of a long climbing season, lasting to the end of June. Yes, because autumn, winter and spring are all very good for tasting a little bit of Spanish rock. Now the weather is amazing, the days not too short yet and climbing conditions are simply perfect… so… what are you waiting for?? It’s time to go out and climb!! We were quite for a very long time, fully absorbed in other projects, and we are very sorry for having the blog and the web page forgotten for so long. But now the crew Climb In Spain is back on work and we are up for putting online a lot of new content and special offers for you. Our goal is still the same: We want to make it easier for you to Climb in Spain. 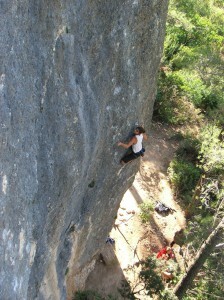 We organize climbing trips to Spain and especially Catalonia with everything you need: accommodation in a beautiful and well-located rural house, guided climbing with a qualified climbing guide, pick up service from/to the airport and all the transfers from/to the climbing areas during your stay. We provide all the information you need and spare you all the communication and logistical problems related to the organization of your trip. With us, you will discover the stunning walls of Montserrat, our home mountain, visit the most famous climbing areas such as Siurana, Montsant, Margalef and Rodellar and also discover many other little treasures, hidden in beautiful corners of Catalonia and the rest of Spain. Very soon, we will publish our special reopening offers: stay tuned!